The resolution parameters are: 1920x1080; after downloading you should import all files to the server database. The command New/Graphics at the right part of the window Media Browser allows you to create a new clip for graphic design. Specify the video format and a number of audio-channels for the created composition in the dialogue window, after this a window with the integrated graphics editor will appear on the screen. An example of composition design is displayed at the picture from the top part of the page. In the section General you should configure the general settings of a new composition. BG Type is a type of backing. Opaque is for the non-transparent backing, Transparent is for the transparent backing. The default value is Auto: Transparent. Leave the type Auto. Duration means general duration of a graphic composition. The value by default is --:--:--:--, it means that the composition has infinite duration. Leave the value --:--:--:--. Lead Out is the parameter that defines the time that a composition with infinite duration needs to implement “leaving” effects for its objects. In our example, all objects will have ten frames duration of a final effect. To finish the “infinite” composition correctly, with final effects, when pressing Stop Seq or GoTo in the playlist of graphic events, you should specify the value Lead Out as equal to the effect duration - ten frames. Wipes is used for adding static pictures (BW patterns for transitions) into the composition. By pressing the button Add, add H_Wipe_1, then H_Wipe_2. The item Show wipe allows viewing patterns in the editing window. Now open the tab Elements. Place the window Media Browser near the graphics editor window and drag the loaded clip (that contains the “cycle”) with the Lower 3rd LOOP backing, from Media Browser directly to the editing window. Herewith, a new PIP object will be created automatically: the clip name will be read off from the database and will be entered into the first Url field, the values In and Out for the clip will be also read off from the database. The initial sizes of the clip will be saved. The value in the field Dur won’t be set up automatically; the default value is --:--:--:--, it means that the clip with a backing will be played out in the infinite cycle. Create the first text object by pressing the button New Text Object in the editor Top-menu: title NEWS. In the field Name of the item Elements, you can define a random name for the object. If you select an object in the tab Elements, you can right click on it and move it to the higher layer (Raise) relative to the backing. Then you should configure the font, color, fringe and position of the object. Use the same way to create two another text objects: the main text of news (Main Title) and the additional text (Small Title). You can adjust the type of parameterization for the main and additional texts (section Elements – item Parameterization – field Type). Choose the External type of parameterization: if so, you’ll be able to change the texts directly from the playlist, or by using Time Line in the application News Cut(without using the editor). The backing has the resolution parameters W=1920, H=1080. It is placed in the composition without the shift (X=0, Y=0, see the field Position). The backing will be displayed during the whole duration of a composition, respectively, the values Sh/In and Hd/Out in the field Show/Hide are 00:00:00:00. The file with the backing has duration of 00:00:06:01, you should leave the value --:--:--:-- in the field Dur to make the displaying cyclical. Wipe is for the Gradient Wipe effect; it uses a static picture that contains a transition template (Wipe). 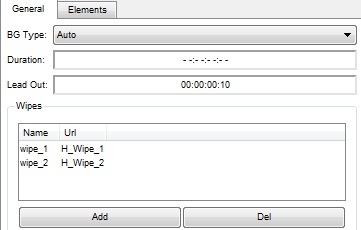 Set similar values for appearance and disappearance of the backing: Type=Wipe, Dur=10 Frames, choose Wipe (In)=wipe_1, Wipe (Out)=wipe_2 (see the picture). To view mix/wipe effects in the editing window, activate the black button “X” in the editor Top-Menu: move the scrolling bar at the lower part of the editor and see the result. Configure the text objects NEWS and Main Title: set the same Show/Hide and Mix In/Mix Out parameters, as for the backing. Program the animation by the key points for the object Small Title. To set the first key point, use the scrolling bar and set the point that will start implementation of the effect (for example, 00:00:00:05). After this you should specify the first point: press "+" at the editor top field. The temporal value, which conforms the first key point, will appear in the field Key Points – Time; the fields for editing the values will become active. Clip to original restricts a visible area of an object with the values originally set in the field Position (the position along the XY axes and sizes of the WH area). Activation of this parameter will allow the text to “come out” along the Y axis (for example) not from the very bottom edge of the screen, but from its current bottom position. Smooth is a smooth change of the moving speed. If the parameter is not set, the moving speed of an object from point to point will be linear; if the parameter is activated, the speed will be smoothly reduced when it's close to the point. Then, you can move the scrolling bar for fifteen frames forward and set up one more key point (00:00:00:20), then select the value of the first point (00:00:00:05) in the window Time and configure the parameters for moving the text. DX and DY shift the text along the coordinate axes for the definite number of pixels. Set the value DY=82 for the first point: the text will move down, the value of the second point stays “0”, therefore, the text will “come out” from the bottom during the execution of an effect. By moving the scrolling bar at the bottom part of the editor, you can see the result. This is the final step of editing the composition. You can download an example of a ready composition by this link. When you download the file, you should import it to the server database. To playback graphic clips, you should use one of the Broadcast windows (CAST_LAY1...CAST_LAY8). You can open an appropriate window from the menu Window/Broadcast in the Air Manager application. Similarly to full screen playout, every CAST_LAY... window displays a list of on-air events for the appropriate graphic layer. There is a possibility of simultaneous playout of several graphic playlists (up to eight), each layer has its own playlist (the playlist/layer LAY1 is the lowest). To create a new line in the playlist, you should drag the selected clip from the Media Browser window to the Broadcast window (for example, CAST_LAY1). 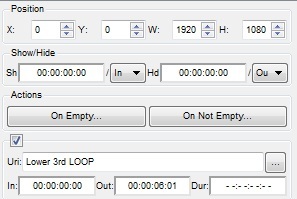 The information about the clip will be automatically set into the line, in the column Start you can set a desirable type of start for the event (Auto=Sequence by default). For the “manual” mode of graphics playout (for example, in broadcasting studios), you’d better set the Manual type of start for every event. You can change the type of start in the mode of editing the line: select the line (single click) and press Enter, or click the line 2 times. In the configuration menu (File/Configure) of Air Manager you can change the default type of start for all recreated events; to do this, choose the tab Actions and set Manual in the field Default Start Type. Now you can playback events in the random sequence by selecting them in the playlist. You can start playout by pressing the button GoTo, and stop it by pressing the button Stop Seq. If you chose the parameter Lead Out while editing, compositions would be finished correctly, with final effects. You can implement a quick change in a composition (without using an editor), if you choose the item Parameters (right-click on the selected playlist line). You can find more information about parameterization of text by this link. If you want to control playout in a more convenient way, you can configure Hot Keys or use an external control panel. Read here, how to configure Hot Keys.